When I was first diagnosed with cancer in 1994 I gave up COF. People used to say that COF was bad for you. It turns out that not only is COF good for you but caffeinated COF is better than decaffeinated COF…I drink two cup of strong COF every morning. Apparently even two cups o’ joe may not be enough. Caffeinated coffee puts me in a positive mood, motivates me to work out, and gets my brain firing. Good and good for you? 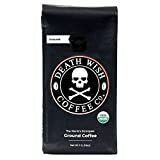 I drink Death Wish Ground Coffee, The World’s Strongest Coffee, Fair Trade and USDA Certified Organic. Maybe the name helps me remain in complete remission from my “incurable” cancer. All I know is that this coffee is amazing!!! I am a cancer survivor and cancer coach. Never have I found a cancer therapy that tastes great and helps you beat cancer. For more information about non-conventional cancer therapies scroll down the page, post a question and I will reply ASAP. Slash Your Breast Cancer Risk of Relapse Now! Can COF KO Cancer’s Return? “There was a time when I, along with many newly diagnosed cancer patients, stopped drinking COF. The idea was that COF was bad for you.